Welcome to the official site of North Texas Free-Mo HO scale modular railroading! May 21-23 meet a success! North Texas Free-Mo in conjunction with the Prototype Modelers set up on May 21-23 2010 at the Keller Lion's Club. 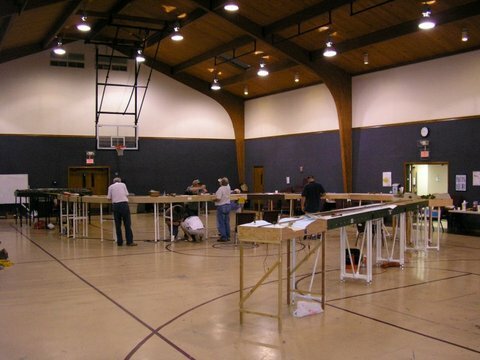 The Free-Mo layout had 283 of main line trackage and stretched end-to-end of the facility. Several prototype modelers participated in the event with folks from all over Texas and as far away as Pennsylvania. Thank you to ALL that participated. Visitors saw several trains running during the operation sessions from as many as 6 main line trains passing each other and switch crews to several switch-list generated operations. Be sure to check out the Yahoo groups photo pages for photographs of the event. Everyone is looking forward to next year, so stay in touch! DCC Provides the greatest opportunity for realistic operations. DCC Allows for awesome light and sound effects. DCC Allows for turnout control from any throttle or location.